Thanks. I'm still deciding whether I want all the updates to be in journal format or whether I'll do some out-of-character reports as well. I'm thinking I'll try to mix it up but I do like the idea of speaking as my MyPlayer, as it's a little different to what I've done in my previous story threads. Cool, will keep that in mind. Follow the life of an NBA rookie with our top pick in the 2012 NBA Draft, Aussie Andrew "A-Train" Begley! Hey Nuggets fans! Now that we're back home from a three game road trip, I thought I'd check in with a new journal entry. I hope you're as stoked as we are about this nine game winning streak we're on. It's early days but it feels like big things are in our future, maybe sooner than any of us expected. We don't want to take our foot off the pedal just because we've gotten off to this hot start, but at the same time, we're enjoying the ride. Last time I checked in, we were on our way to Phoenix. Against the Suns, Coach Karl surprised me by giving me my first career start and I've had the honour and privilege of starting alongside Ty in the backcourt ever since. I know there are some doubters out there and that's OK, I'm just going to keep giving it my all and doing what the team asks of me. You've probably seen the new billboard by now, with Iggy, Ty, JaVale, Kenneth (excuse me, THE MANIMAL!) and then myself, front and centre. Rest assured, the fellas have given me some good natured ribbing over that! Just the way it is when you're a rookie. The team has been very supportive of me as I've moved into this new role, which has helped take the pressure off, especially when I had a couple of rough nights shooting the ball. It's a daunting task to move into the starting five ahead of a player like Dre, a huge fan favourite here in Denver and a guy who's had a long and successful career in this league, but he's been a total pro about the whole thing and that's helped a lot too. I feel I had the best game of my career in our last outing against the Timberwolves, where we wrapped up our ninth straight win. I've not been finishing around the rim as well as I'd like, as well as I know I'm capable of doing, so it was very satisfying to be more effective getting to the basket in that game. I managed to snare a few boards, which is always a great feeling because I played power forward and centre in the junior leagues growing up and prided myself on that. I thought we ran our offense really well and continued to build a rapport on the court. Yes, those eight assists set a new career high for me, but it's a lot easier when you have finishers like we do and an unselfish attitude from everyone on the roster. It's fun to be a part of and I'm glad to be contributing. 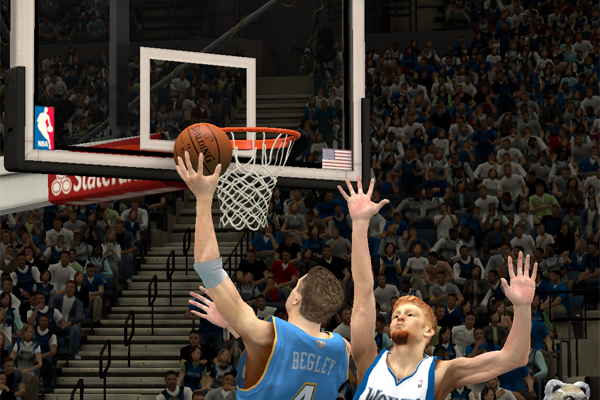 We got a big win over the defending champion Miami Heat the other night, pulling it out in the fourth quarter. I had the opportunity to help put the game out of reach in the final minute, when were in the bonus. I can easily say that's the most pressure I've ever felt playing basketball but at the same time, those are the moments you dream about, cliche as that sounds. It was a great feeling to knock down all four of those free throws! The win in San Antonio was hard fought too, even though we won that one by 18. So many lead changes in that one, I think it's safe to say we all gave it everything we had. We just had it going on in the fourth when we scored 40 points to take control for good, though. Against such a tough team, that was a huge confidence boost. I also met up with another fellow Aussie in Patty Mills. I had to guard him on a couple of possessions and man, the guy's a blur. Tomorrow we've got the Warriors at home, then the Nuggets on Sunday before we're off to Utah for our second meeting with the Jazz this season. We're not about to take anyone lightly, but of course we're confident that if we show up and play our game, we can make it ten in a row tomorrow. We're finishing up the month with another game against the Warriors on the road then we're facing the Lakers in Los Angeles, which will definitely be a test for us. We're not about to back down from the challenge, though! Thanks again for all your Tweets, some of you are kind of crazy but in a really good way! Really appreciate the support and the way you've made me feel welcome. If you're coming to the game tomorrow night, be sure to make a lot of noise! If you can't make it to the arena, don't forget to catch us on TV! We've got a really good thing going here. 1. Great job so far. Enjoyed the two journal articles. Will be interested to see how quickly you get through a season. 2. I got drafted by the Nuggets too and interesting to see what a difference 6'3" v 5'7" will do! 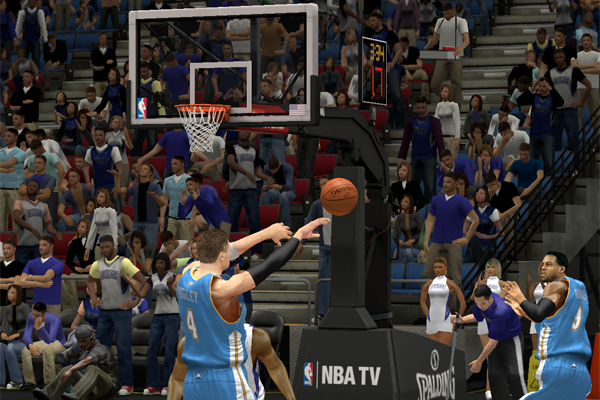 I cannot make an impact with my virtual player while you are shooting the lights out from three point range. You are doing better than Gaze and Heal - keep it up. Thanks man. I feel I can get through it fairly quickly as I am enjoying myself and I usually set aside some time to play two or three games at once. It helps that I'm not doing recaps for each and every game and moving forward in my NBA Live 06 Dynasty I'll probably do the same thing, just having a featured game similar to what badreligionau does with TNL along with recent scores and news. Hey, you're consistently putting up higher numbers each game. That's a good start. You guys are tall. I'm barely 5'5". In basketball terms though, I'm still on the shorter side. Probably should've made myself 6'7", but still having fun as-is. How's it going, Nuggets fans? As you know, we managed to extend our winning streak to ten before our run finally came to an end. We've had a couple of tough losses in the last few games but we're not going to let ourselves get rattled. We've still got the best record in the league and you can bet that we'll be giving it our all as we try to stay on top. We're not taking our hot start for granted but we know we're legit and even though it's early, we're looking to make a serious run at winning it all. After all, if that isn't your goal, you shouldn't be in this league. Yes, I've been reading your Tweets and yes, I haven't been doing so well scoring the ball lately. Believe me, I'm spending a lot of time between games trying to work out the kinks in my jumper, but fortunately we've got some really talented scorers on this team. My job is to do what's needed of me and some nights I'm called upon to be more of a facilitator, which is actually pretty fun when you've got guys like Iggy or JaVale to pass to! I appreciate all the support though, all the enthusiasm you guys have for me to succeed and put up big numbers. It's all about opportunity and right now, we're all just trying to do what we can to keep winning games. Previously, I said my toughest assignment so far was a short stint guarding LeBron. 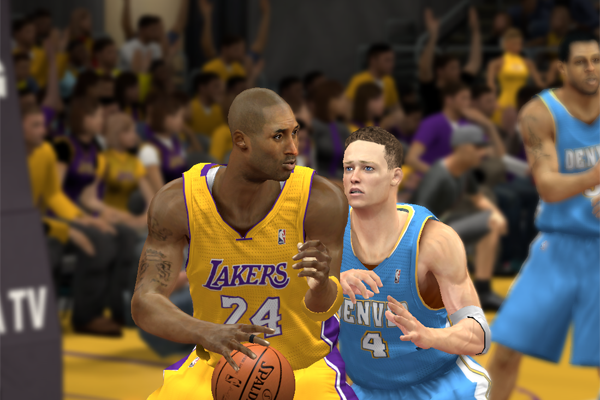 Having had to guard Kobe for a whole game, I can easily say that was my toughest night in the NBA! I grew up a huge Michael Jordan fan as you know and to me MJ remains the greatest of all-time, but Kobe's still an all-time great and a special player. Supposedly he's getting towards the end of his career but he made those 49 points that he scored against us look very easy. I was able to bother him on a few attempts but he just torched us. We owe him and the Lakers one, next time we meet. I'm going to have to cut this entry short but I'll be posting some more blogs in the near future. 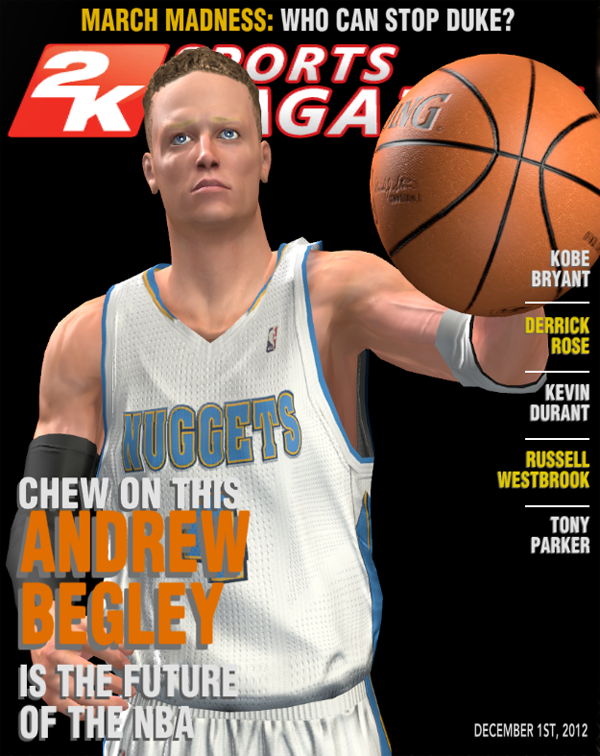 In the meantime, check out the latest issue of 2K Sports Magazine, featuring yours truly on the cover! Definitely a very cool opportunity, hopefully I can live up to the hype. Don't forget to pick up a copy of the December 1st 2012 issue of 2K Sports Magazine, featuring A-Train on the cover! Nuggets fans had good reason to worry when it was announced that leading scorer and starting point guard Ty Lawson would be forced to miss time due to an injury, but as it turns out the team from the Mile High City has kept up their winning ways. Not only are the Nuggets on an eight game winning streak to maintain the league's best record at 22-3, they've found a more than capable replacement to run the club in Lawson's absence: Australian rookie Andrew Begley. The first year player, taken 20th overall in the 2012 Draft, has been making an impact in Denver this season while contributing in several areas, but has recently caught everyone's attention by posting some big assist numbers. Against the Atlanta Hawks, Begley surprised everyone by recording 23 assists, tying the club record set by Lafayette "Fat" Lever on April 21st, 1989. He followed up the historic performance with 18 assists against the Indiana Pacers and last night recorded his second 20+ assist game of his young career, tallying 21 dimes in the Nuggets' win over the Sacramento Kings. Begley has certainly surprised his teammates with his passing prowess. Veteran Andre Miller, no stranger to dishing out assists, shook his head when asked if anyone on the team saw it coming. "Nah, not at all," he continued. "We know he's unselfish and he's had some good games passing the ball, but those are special numbers when all-time greats post them, never mind a rookie. He impressed all of us, that was something special." For his part, the man fans have come to know as A-Train has humbly downplayed the accomplishment, giving credit to his teammates. "They're the ones getting into position to score, finishing the plays. It's a lot of fun playing with these guys," he told reporters after another strong outing. "It makes the game real easy." Lawson is expected to reclaim the starting point guard job upon his return, which will move Begley back to the shooting guard spot, where he has started 18 of the Nuggets 25 games this season. Still, for now it seems as though the team is in good hands as they approach another ten game winning streak. We're on the way back to Denver to face the San Antonio Spurs tomorrow night, so I thought I'd check in with another blog entry. What can I say? It's been an exciting couple of weeks. It's not every day you get to put your name in the record book, tying an NBA team record for assists in a single game. As proud as I am of the accomplishment though, once again I've gotta give credit to the rest of the guys on the team. It's pretty easy to get those assists when everyone is running the floor, getting to their spots and finishing as well as they do. It was very humbling to get a Tweet from the great Magic Johnson after that game. He's obviously a man who knows a thing or two about dishing out dimes, though I can only wish I could do it the way he used to. In any event, I'm glad to be able to contribute in any way I can for the team. We're on another big run right now and we don't want to take our foot off the accelerator. No one thought we'd be sitting atop the league with the record we have, but here we are. Spirits are high, though we've got a big test coming up tomorrow when we play the Spurs. It's like everyone says, they're older but they seem to be getting better with age, you just can't count them out. We're not going to take them lightly and we're going to give it our all as we defend our home court, where we're unbeaten so far this year. We want to keep it that way. Hopefully we can get Ty back soon. As much fun as I'm having filling for him, we need to be at full strength to go as far as we can and right now, it feels like we're capable of going a long way. Coach Karl is the first one to tell us not to get ahead of ourselves, but the way things are going, we're confident that we can hang with anybody and make a really strong run when the postseason rolls around in a few months time. Keep watching Nuggets fans, we plan on keeping this run going as long as we can and putting on a show for you along the way! Those are only two out of 25 games, the majority of which I've spent at shooting guard getting around 4-5 assists on average. That said, it has raised my average significantly within the space of just a few games. Denver Nuggets guard Andrew Begley was named the Western Conference Rookie of the Month for December. 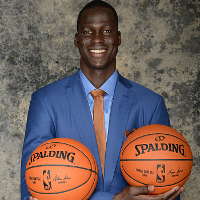 The first year player from Australia averaged 8.1 ppg, 5 rpg, 12.1 apg and 1.6 spg while playing a large part in the Nuggets staying atop the league with a perfect 15-0 record this past month. He has been starting at point guard for most of December in place of the injured Tyson Lawson, who is currently expected to miss the rest of the season. 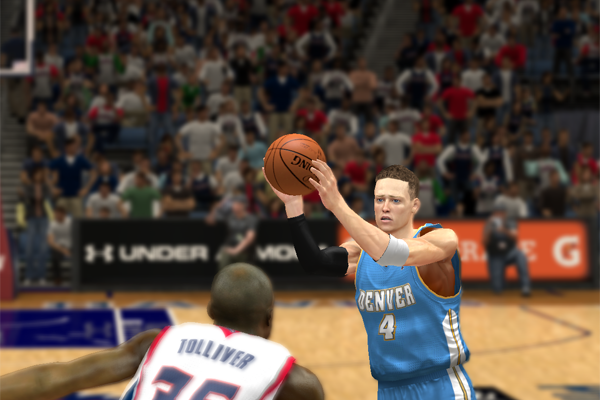 Begley, who has gained popularity with Nuggets fans and affectionately been dubbed "A-Train", also tied a franchise record for assists in a single game with 23, in a win over the Atlanta Hawks on December 5th. He followed that performance with 18 assists against the Indiana Pacers on December 7th, tallied 21 assists against the Sacramento Kings on December 16th and had double digit assists in nine consecutive games beginning on December 14th. The Cleveland Cavaliers' Dion Waiters took home Eastern Conference Rookie of the Month honours for December. Last month, Michael Kidd-Gilchrist and Damian Lillard were named East and West Rookies of the Month respectively. A belated Happy New Year, everyone! It's been quite a ride the past month or so. We've just won our 20th game in a row...can you believe it? Needless to say we're all having a lot of fun right now and while we still don't want to get too ahead of ourselves, we're feeling very, very confident. We were all devastated to hear that Ty is going to be out for the season though, so we're all going to have to do our best to step up in his absence. I've been doing what I can while filling in at point guard and yes, I have to admit I am a little proud of some of my assist numbers. I love moving the ball around, finding my teammates in the spots where they want the ball and seeing them finish. We've been playing some great team basketball so far this season and that's absolutely a big reason why we're in the position we are right now. Everyone is getting along and eagerly doing their job. What can I say, we're really rolling! A lot of you pointed out that I was just one assist shy of a triple double against the Jazz. Yes, I would've loved to have reached that milestone as it's definitely the sign you've had a pretty special night out there on the court, but the most important thing is we got the win. Some of you have asked how I've felt about coming off the bench for a couple of games after being in the starting lineup for most of the season. I'll admit I was surprised as I felt I'd been handling the job well and we've obviously been winning, but you've got to check your ego at the door when it comes to things like that. It's about going out there and doing the things the team needs you to do to win games, no matter whether or not you're starting. Coach has been trying a few different lineups lately to keep the momentum going and as you know, he had me start alongside Dre against the Magic. Whatever role I find myself in, I'm going to go out there and give it my all, you can be sure of that. Finally, I've been getting a lot of comments about my dunks recently. My knees are feeling pretty good these days and I've had some open looks at the rim, so I've been eager to take it up strong for a few slams. It's a tremendous feeling and it just fires everyone up when one of us can break loose for a dunk...I love the old train whistle sound that they've started to play after I've thrown one down! We've got a few more home games coming up, so I'm hoping to see you all come out and cheer us on at the Pepsi Center. We're looking to do something special here, so come be a part of it! Some noteworthy performances over the past month. Definitely will. McGee and Iguodala are both shooting over 60% from the field, so getting the ball to them in a good spot is pretty much a guaranteed assist, so long as they score quickly enough after receiving the pass. Yeah, I'll cherry pick from time to time too. I'm also one for sprinting in and snatching defensive rebounds. Whatever the default is, if I recall correctly. Following this one. 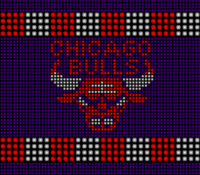 You guys are just bulldozing every team that comes your way. Sure must feel awesome to put up those astronomical assist numbers. Yeah, it's fun. I'll have another update soon but unfortunately the winning streak came to an end as we dropped a couple in a row, however we've managed to string together a few wins since. 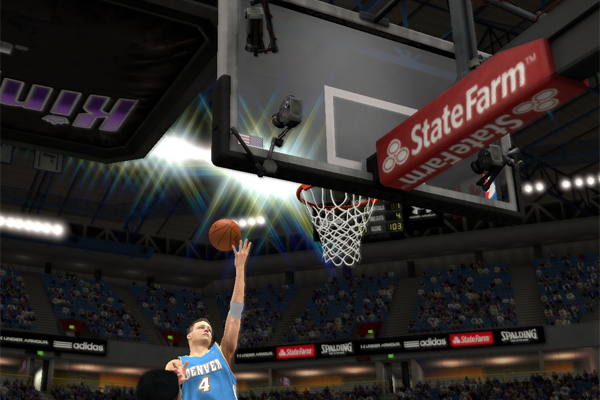 It certainly speaks to how much I'm enjoying NBA 2K13, no question. I realised I hadn't been giving any info on the rest of the league so far this season, so I've rectified that beginning with this update. The Oklahoma City Thunder halted the Denver Nuggets' winning streak at 23 games with a 104-96 victory in Oklahoma City on January 16th. They would also hand the Nuggets their first home loss of the season four days later, 111-101. Denver lost to the Rockets 111-102 in Houston before embarking on another five game winning streak, which included revenge over the Rockets by way of a 102-86 victory in Denver. What's that old saying about all good things coming to an end? To be honest, it wasn't a great deal of comfort after the Thunder broke our 23 game winning streak and then handed us our first home loss of the season just a few days later. We're not going to let it get us down though and we're rolling again after winning our last five. The Thunder are right behind us in the standings though and chances are we're going to meet up with them in the Playoffs if we make a deep enough run, so we're determined to figure them out so we can deliver a little payback when the time hopefully comes. From a personal standpoint, turnovers, shooting the ball and aggressiveness have been a bit of a problem for me lately, but you can be sure I've been working hard on improving my play in all those areas. Coach Karl has me starting at point guard once again and I obviously have a huge responsibility in trying to fill Ty's shoes, so I definitely want to carry my share of the load. It's a job that's certainly been made easier by the way we're shooting the ball. Can you believe we have three of the top five field goal percentage leaders in the league? I'm quite happy to keep serving it up for them, like I've said before those big assist numbers I've posted come pretty easy when the rest of the guys are finishing so well. Last night's win over the Milwaukee Bucks felt like one of our best games of the season and one that I think can get me back on track with my play at both ends of the floor. We want that form to continue through to the All-Star break and beyond, against anyone and everyone. As much as we don't want to get ahead of ourselves, it's hard not to be excited by the fact that we're creeping up on 50 wins and still sitting atop the league standings this far into the season. No guarantees of course, except that we're going to continue to give it our all. Man Dwight must be the leading MVP candidate in your Story? Those are prime Shaq-like numbers! Actually, I think Iguodala is, due to our record. For some reason I'm on that list too along with at least one other Nugget, so it would seem the game is just a tad biased towards the user-controlled team. Andrew, That or biased towards the team that is eating the rest of the league for breakfast? But yeah still you wouldn't expect 3 players. What are Iggy's numbers? Shooting nice %s by the looks of it.